The case is conducted by the prosecutor Joseph Wohnrau (Josepha Wohnrau). The criminal investigation began in September 2016 and is conducted on the grounds of fraud and unfair business. This is reported by the Luxembourg Information Agency Luxembourg Herald. 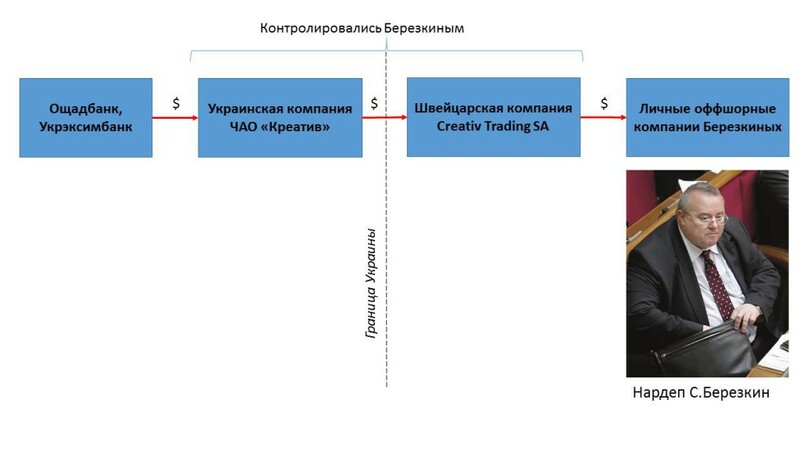 Applicants are the Ukrainian company Private Joint Stock Company «Creative» and the Swiss company Creativ Trading S.A. Both companies were part of the Agro-Industrial Creative Group, but now both companies are in bankruptcy proceedings. Agroholding Creative was founded by Stanislav Berezkin, who owned the Creative group until July 2015, when the group was sold to private investors Arthur Grantz and Rysbek Toktomushev. The company with debts of more than 650 million US dollars was sold for 25 million US dollars. The new owners intend to restructure the debts. However, soon after the purchase, the new owners discovered falsifications of financial statements, which, according to new owners, made impossible the restructuring of debts. As follows from the plot of the case, the Berezkins organized a scheme for seizing the banks’ credit resources, for which they used the Swiss company Creativ Trading S.A. It is the presence of the Swiss company in the scheme of embezzlement of credit resources that determines the jurisdiction of the Swiss prosecutor’s office. It is, first of all, the appropriation of credit funds from the two state-owned banks of Ukraine — Oschadbank and Ukreximbank, which gave over 400 million US dollars to Stanislav Berezkin’s companies. On the basis of «fake» contracts, deliveries received credit funds were deducted to the accounts of the Swiss firm Berezkin Creativ Trading S.A. Further, again on «fake» contracts, the funds were transferred to the bank accounts of Berezkin’s personal offshore companies, whose names are not disclosed in the interests of the investigation. An important element of the criminal case is that the children of Stanislav Berezkin, Maxim and Victoria Berezkin, held executive positions in companies and took a direct part in the implementation of the criminal scheme. As a result, the money of state banks of Ukraine was stolen, and in two companies — in the Ukrainian company PJSC «Creativ» and in the Swiss company Creativ Trading S.A. — there were huge debts, which led to their bankruptcy. According to the publication of the Luxembourg Herald, despite the declared fight against corruption, Ukraine remains one of the most corrupt countries in Europe. «The recent public declaration of assets by state employees of Ukraine has shocked the European public. The scale of wealth accumulated by Ukrainian politicians is shocking: fashionable sports cars, luxurious mansions, expensive watches, mountains of cash and even private churches … The Berezkin case is indicative of the way in which such riches go to Ukrainian politicians, «the Luxembourg Herald said. As you know, in Ukraine criminal cases are being investigated against the family of the people’s deputy Berezkin to bring Creative to bankruptcy, fraud and large-scale embezzlement. The initiation of a criminal case in Switzerland was a logical continuation of the unraveling of the bunch of Berezkin’s machinations. Thus, the scandalous business of the agricultural holding Creative gets a new round of development. This is not just a story about Ukrainian crooks. The case of the agricultural holding Creative promises to become a history of international bank fraud with criminal prosecution and legal proceedings in several jurisdictions.